Its been far too long between drinks in NSW and VIC, but it looks like for “some” that the dry streak will end over Friday and Saturday. 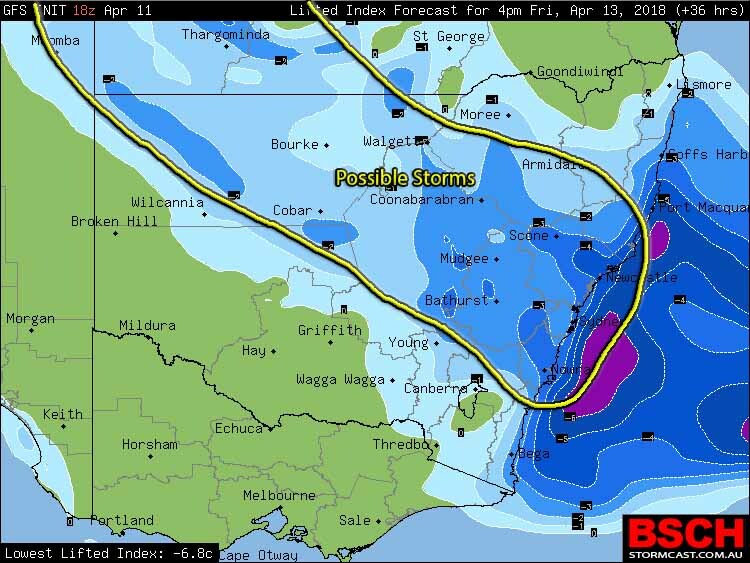 Above image showing potential storm area via BSCH for Friday. 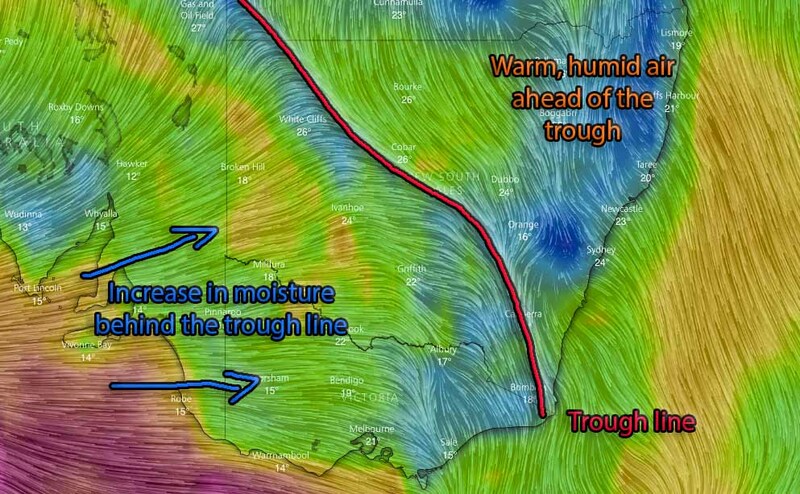 A trough / cold front combination moving through South Eastern Australia is drawing in high levels of heat into areas ahead of it. Thats lead to several areas across South Australia breaking April records, with several areas across NSW and Northern VIC also challenging and breaking records. Behind this front though, a deep onshore flow is expected to increase moisture levels exponentially leading to an increase in rainfall, while an increase in storm potential is also expected along and ahead of the front. 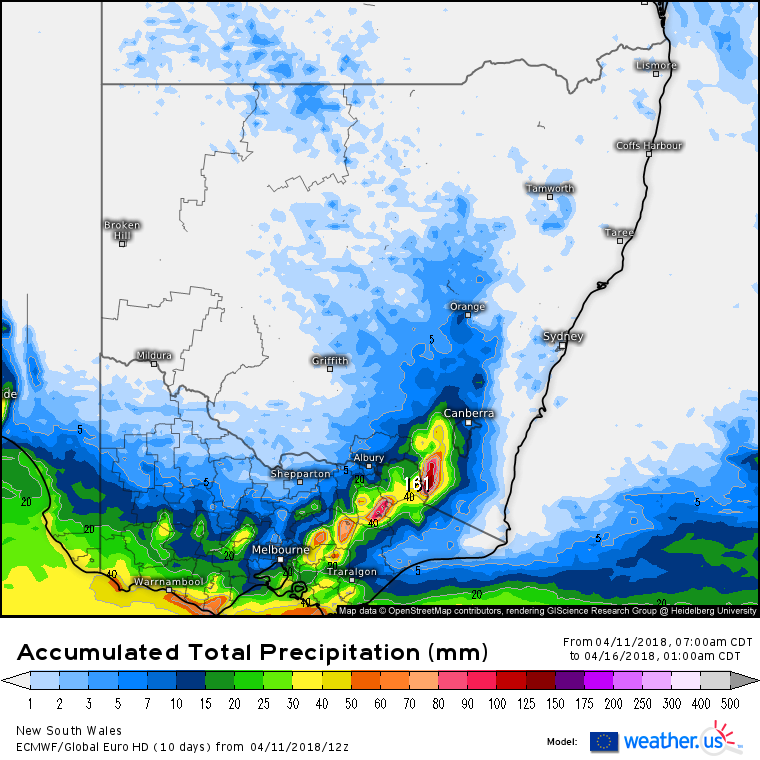 Thunderstorms are possible across Inland NSW on both Friday and more so on Saturday, however they are likely to be hit and miss with heavy rain under them, but minimal rainfall in terms of accumulation. The better rainfall is likely to occur behind the system as showers and rain areas occur. Unfortunately, not much rain is forecast for most areas… so its going to be very underwhelming, but for others (especially across VIC) there is the potential for good falls. 25-50mm is possible over the South West Coast and 50-100mm seems likely over the Snowy Mountains and Dandenong Ranges, extending into the NSW Southern Tablelands also. Isolated higher falls are possible, but for most… 50-100mm seems more realistic. Its the best we can offer for now, so hopefully some areas can benefit more than anticipated from the storms and the gaps can fill in over the coming weeks with more cold fronts.